In the first installment of our “Importance of Gut Health” series, we covered the impact of good gut health on digestion and absorption. This next segment will focus on the implications of good gut health on immunity. In biology, immunity is the balanced state of having adequate biological defenses to fight infection, disease, or other unwanted biological invasion. A majority of the immune system, over 70% in fact, lies within the digestive tract. This without a doubt, confirms why good gut health is essential for maximum growth and performance and optimal health and well-being. Our livestock are consistently ingesting bad bacteria that are good for your animal, but why don’t they get sick? Their gut protects them from it! The good microbes that live in the gut have are responsible for protecting the body from the bad microbes (pathogens) that may try to enter and cause sickness. Firstly, the good microbes compete with pathogens for space and food in the gut. When the good outnumber the bad, it becomes easy to eliminate pathogens. Secondly, the good microbes improve overall gut health and strengthen the physical and chemical defense mechanisms of the gut. Physically, good gut microbes initiate immune responses in the cells lining the gut wall, ensuring those cells will do their job to prevent invasion of pathogens and infection. Chemically, good gut microbes prevent against infection by keeping the gut acidity, or pH, correct. The gut was designed to be relatively acidic for a reason, to make it a hostile environment for pathogens trying to invade the body. Keeping that acidic pH at the right level, not too high and not too low, is a key to good gut health and very important to the immune function of the gut. Now knowing the significant role the gut plays in immunity, what can you do to help ensure your livestock have the good gut health necessary to boost the immune system? Provide a diet that is fully fortified with all the vitamins, minerals, and trace minerals needed daily. Although needed in minute amounts, these nutrients are absolutely essential to maintaining optimal immune function due to their role in many cellular functions. For ruminants, provide plenty of high quality forage and fiber. This provides fuel for good microbes to thrive in the rumen of the cattle, sheep, and goats. Minimize stressful situations. Stress can cause animals to go off feed and alter metabolic processes and lower efficiency of digestion and absorption of nutrients. Provide a probiotic and/or prebiotic supplement to thoroughly enhance gut health. Amaferm®, the proprietary prebiotic found in all BioZyme® supplements improves gut health and strengthens the gut microbe population to assist in improving the resilience and barrier functions of the gut. 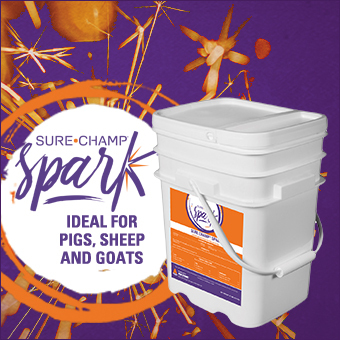 Luckily, BioZyme is committed to providing products that help our customers improve good gut health and products such as Sure Champ Cattle or Sure Champ Spark can help do just that. 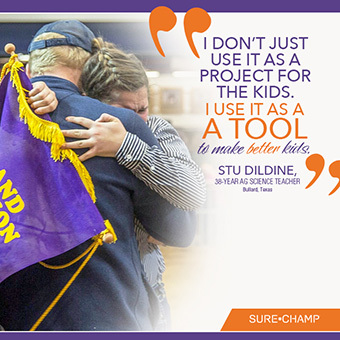 The ever popular Sure Champ Cattle is a fully fortified vitamin and mineral top dress. Top notch nutrition combined with the Amaferm advantage, allows cattle stay on feed at home and on the show road and stay healthier throughout production. Sure Champ Spark on the other hand is a supplement that primarily contains Amaferm and MOS. This dynamic duo is the perfect defense against pathogens that may try to attack the animal’s immune system. MOS actively removes pathogenic bacteria, while Amaferm improves the absorption of vital nutrients needed to maintain optimal animal health. Maintaining proper immune function through good gut health its quite easy to achieve through the use of BioZyme products. For more information on these products, visit http://surechamp.com/product-categories/sure-champ-products/.